The Austrian bank’s shares sank 14 pct after nasty surprises in Romania and Hungary led it to predict a 1.5 bln euro loss this year. The charges should be one-offs, and Erste doesn’t need capital. But the bank has to be more cautious about business in its riskier outposts. A man with an umbrella passes the entrance of the headquarters of Austrian Erste Group Bank in Vienna June 24, 2013. Erste Group, Austria’s biggest bank by market value, said on July 3 it expects to make a net loss in 2014 of between 1.4 and 1.6 billion euros ($1.9 to $2.2 billion). Analysts polled by Thomson Reuters had on average expected Erste to make a net profit of 572 million euros. 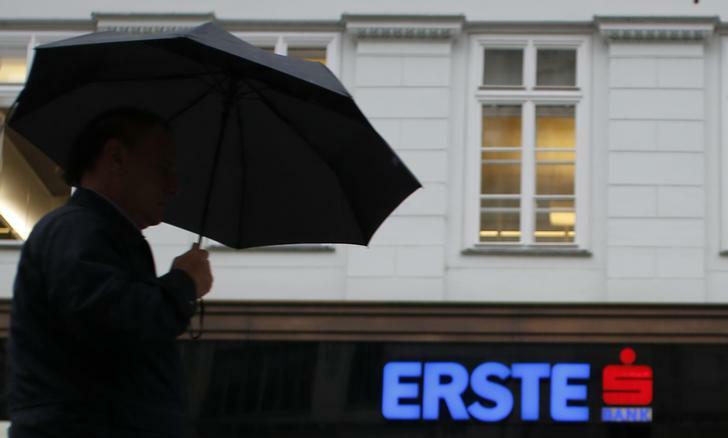 Erste said it would increase 2014 provisions from 1.7 billion euros to 2.4 billion euros. Around 300 million euros of this reflects retroactive moves by Hungary to reimburse customers for fees on foreign-currency mortgages. The other 400 million euros reflects increased risk provisions in Romania, where the central bank wants to speed up the reduction in domestic non-performing loans ahead of the European Central Bank’s asset quality review of euro zone banks. In addition, Erste is writing off 800 million euros of goodwill in Romania, and 200 million euros of deferred tax assets. It also said it would take a provision of between 200 and 400 million euros against potential losses from converting foreign-currency mortgages into Hungarian forints. Erste shares fell 14.8 percent to 19.8 euros on the morning of July 4, giving the group a market capitalisation of about 8.5 billion euros.